Interior of 221b Baker Street – Can you find the links in the Sherlock Holmes canon? Click on the image to enlarge…. 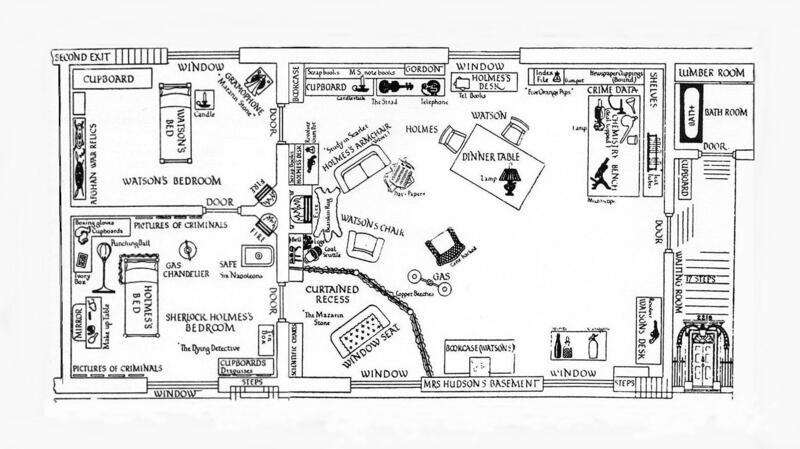 Let us know any interesting links to the floor plan that you have unearthed – you can post comments on the Forum on SherlockHolmes.com, contact us at MX Publishing – or get involved with The Great Sherlock Holmes Debate. No problem =) Ok, I just pulled my copy of The Hound of the Baskervilles and read and reread the part about the “small medical shelf.” Perhaps only one of the shelves in the bookcase was devoted to medical texts, and the other shelves to different genres? Or perhaps the bookshelf was a later-installed upgrade of the shelf? That’s all I can come up with on one cup of coffee. I can see Sherlock Holmes taking over Watson’s bookcase. I can see that in a heartbeat. I just read the 60 stories (Canon) and wondered how Baker Street could possibly hold all of Holmes’ notes and scrapbooks and indexes! I fear poor Watson had to give up a LOT of space to his friend.